Who is Cranberry Shores Chorus? 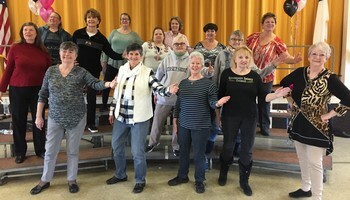 Cranberry Shores Chorus is an organization of female singers, who meet regularly to practice, perform, socialize, and have fun. We currently have 16 singers of all ages, all walks of life, and from all parts of the Southshore - from Cape Cod to Wareham to the Plymouth area. .
We rehearse every Tuesday evening at 7pm in Fellowship Hall behind the Federated Church in Hyannis. The hall is at 81 Willow Avenue..
Want Cranberry Shores Chorus to sing at your next function? Why not hire Cranberry Shores Chorus to entertain at your next event? We can perform at corporate functions, charity events, community Entertainment events, christmas parties, awards nights.